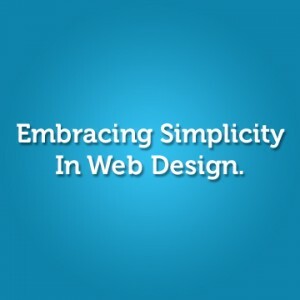 Simplicity is a good thing when it comes to website design. Not only do sites look better – but they’re also easier to navigate and it becomes are easier to achieve your desired outcomes. Are you looking to de-clutter and get more out a more simple design? Here are five tips you can use. Essentials, only – While it might seem obvious on its face, you’d be surprised to know just how many websites fail to maximize their essential elements. The problem lies in the fact that to most people, EVERYTHING seems important. It’s hard – sometimes impossible, even – for them to prioritize. If you want a simpler design, try to focus not on what’s important, but rather – what is necessary. Just like with any piece of artwork, putting the primary focus on the essential elements is paramount. Put the 80/20 rule to work – This is a great design rule that was crated not so long ago that says that 20% of what’s on a page gives you 80% of the value. Especially when it comes to achieving specific objectives (for example, getting people to sign up for your newsletter) – it helps you focus in on the core pieces that allow you to accomplish it. It also helps you de-clutter and create fewer distractions from the core functionality of the page. Reduce the number of pages – This really isn’t AS MUCH about clicks and more about making the site more user friendly. Get into the mindset of your visitors. If you went to your site, what are the key things that you’d want to do? Do you want to find information? Contact you? Once you identify those pieces, then make sure you create the pages that facilitate those actions and nothing more. Get above the fold – Almost all the primary research on how people read websites says that they spend an overwhelming amount of time reading the information at the top of a page as opposed to the meat when they scroll down. If you want to be more effective- make sure the main content and calls-to-action are above the fold. Keep the color down – Try to keep your color scheme at about 2-3 colors to start off with. Color is great, but it can also be tremendously distracting. In website design, the content is the design and design is the content. They need to complement each other. If the idea is simplicity and making it easier for people to accomplish the goals you have set out for them to do – then the colors shouldn’t distract from the directive orders of the content. Hopefully you now feel well prepared to start simplifying your website. Heading forward, you’ll be proud of your site, knowing that not only does it look and feel great, but most importantly – that your visitors will have the best experience possible.